The High School Chorus is made up of students who simply enjoy singing and learning to improve their voices. 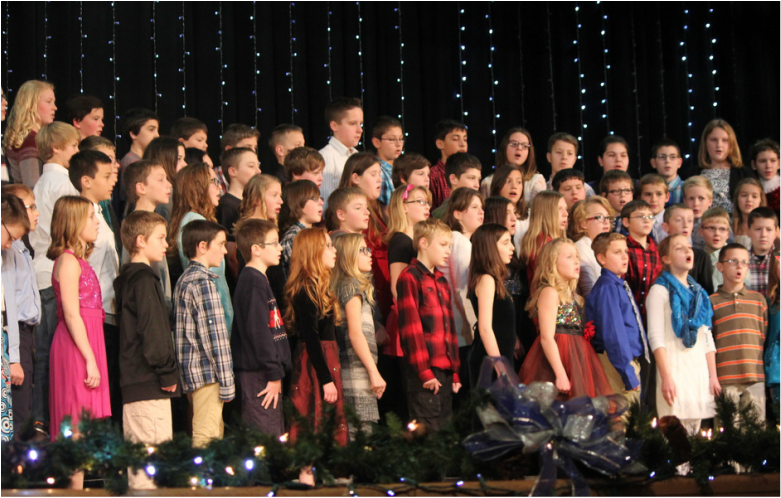 The Chorus meets during second hour, and performs together at Veteran's Day, Christmas, Spring Concert, and graduation, as well as District Chorus Festival. Although there are many opportunities for solos, you are never required to sing alone unless you volunteer! The Chorus council is a great leadership opportunity and singing for the community and caroling presents service experience. We sing all types of music, learning about music from earlier times, as well as spirituals, gospel music, jazz, ballad, rock, and pop style singing. The chorus has done extensive travel from Virginia Beach, Toronto, St. Louis, and New York to closer areas such as Marquette and Green Bay. We would like to invite all NHS students to join "the mighty chorus!" Band is a performance intensive course, and is aimed at the development of the musician, promotion of school and community spirit, and expression through music. Following the 9-week 'Knight' Band field show season, the concert band focuses on performances for holiday, festival, and spring concerts. Over the past 15 years, the Norway High School Concert Band has earned top Division 'I' ratings at Michigan or Wisconsin Instrumental Festivals 14 times. Our excellent 7th and 8th grade combined band has achieved a similar record. Special activities include trips to NMU Band Day, solo-ensemble festivals, and every two years an out of state performance trip. Students can come into band at any grade level, but typically begin with our 5th grade program. We invite any student to explore music at Norway High School, and be active in the'Knight' Band! The award winning 'Knight' Jazz Band meets once weekly and is offered to the instrumentalist who is interested in performing a variety of jazz, rock, ballad and pop styles, as well as learning the basics of improvisational soloing. The jazz band has qualified for State Festival every year since 2006, earning top ratings in 2006, 2007 and 2008. The jazz band performs at many area concerts and events as well as holiday and spring concerts, UWGB and NMU Jazz Festivals and school functions. Students who participate in the jazz program are required to be involved in the class.